The Original Kilburg model includes a minute hand, which allows the user to tell time more accurately – to the exact minute after the hour. Includes the new LED lighting system. As technology continues to advance and the concept of a “global economy” gains more and more acceptance. It becomes increasingly necessary to know, or at least be aware of, the time in other parts of the world. For more globallyminded people it is even more critical to know the hours of daylight throughout the world. Geochron is available in three (3) models. Each model can be customized or upgraded to your specifications (see options). The Original Kilburg Geochron includes the Minute Analog feature that reflects the exact minutes after the hour. It is offered in 9 laminate finished and 3 trims. The Executive Model Geochron is laminated with a real wood finish. A choice of nine (9) finishes are offered. It includes a matching counter top display stand with polished brass fittings. It also can be wall or flush mounted. 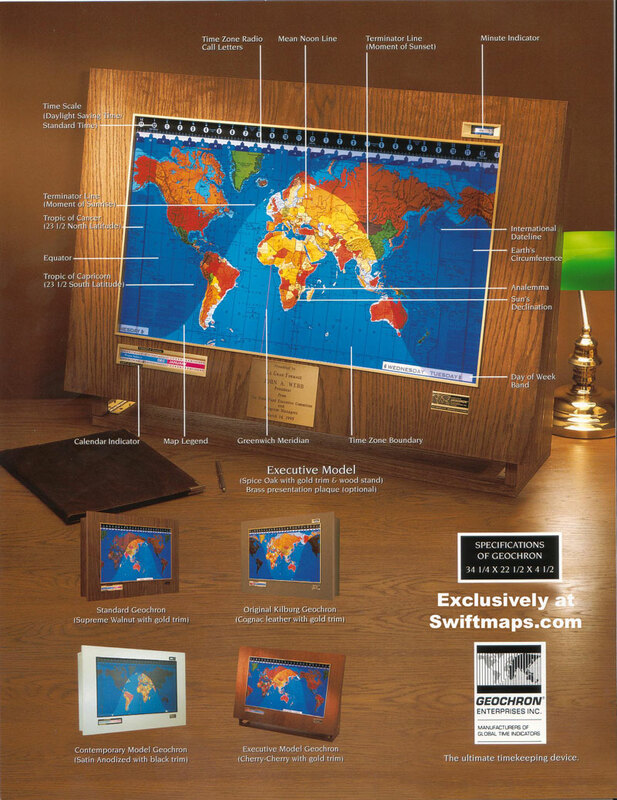 The Boardroom Model is our “top of the line” Geochron. It is a bit larger in size (36″ x 24″ x 5″) and looks best if “flush mounted” into the wall. Flush Mounting Brackets are included. Each model Geochron is available in a choice of electrical configurations in the case of special needs or use in foreign countries. Please email upon your order with your specifications. Standard orders will receive 110/60 electrical configurations. The Geochron Global Time Indicator simultaneously shows the correct time, day, date, and distribution of daylight and darkness everywhere on the Earth…at a glance. 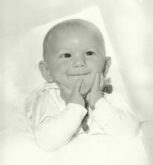 NASA, the CIA, the United States Treasury Department, the Air Force, the Navy, and the Coast Guard use the Geochron to provide simultaneous global information. 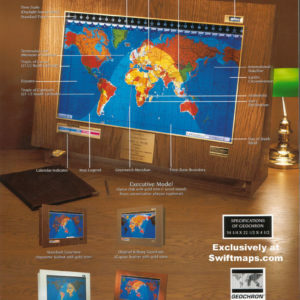 Whether you are a president, potentate, business executive, student, or world traveler, Geochron is the perfect device for your global time orientation needs. Geochron includes a 0 to 60minute analog scale, which is located at the top of the map and is set in fiveminute increments. The map itself is a continuous belt of mylar film in constant motion, moving from left to right one inch per hour in synchronization with the Earth`s orbit around the Sun. Precision indicators display the month, day, and time for all 40 time zones. Geochron also displays the winter solstice, summer solstice, and fall and spring equinoxes each year as well as the current seasons everywhere in the world. The Geochron was invented more than 30 years ago by James Kilburg, inventor of the car cigarette lighter and the first automatically dialing telephone. Each Geochron is totally handcrafted to meet your specifications. 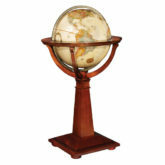 It resembles a framed, lighted world map, three feet by two feet, and is ideal for wall mounting. Includes analog 0 to 60 minute scale for additional precision. Choose from gold, silver or black anodized trim. Surface mount bracket included for easy mounting. WHY CONVENTIONAL CLOCKS ARE OUT OF TIME: As technology continues to advance and the concept of a “global economy” gains more and more acceptance, it becomes increasingly necessary to know, or at least to be aware of, the time in other parts of the world. For more globally minded people it is even more critical to know the hours of daylight throughout the world. Yet even the most advanced clocks of today are merely time indicators, devoid of any other vital information. That is, except for the Geochron. THE DIFFERENCE IS NIGHT AND DAY: In addition to providing you the time anywhere in the world (not to mention a refresher course in geography), the Geochron also communicates important, constantly changing information not available from any other source. As a result of its simultaneous, horizontal, and vertical movement, the sun button describes a figure eight pattern, crossing the “mean noon” four times. The pattern is called the “analemma.” As you can see from the photos on this page, this sunlight distribution pattern changes perpetually, as days and seasons progress. 24 HOURS. 40 TIME ZONES: You probable already know how the earth is divided into 24 “standard” time zones. But did you know about the 16 additional “nonstandard” time zones? Don’t worry. The Geochron has them all covered, all year long even during periods of daylight savings time. What’s more, the map on every single Geochron we make is designed to reflect changes in the world order (for example, the unification of Germany, the breakup of the former Soviet Union). The Original Kilburg Geochron features a minute analog, in the upper right hand corner, to make it even more precise. HOW TO TELL TIME WITH GEOCHRON: What about those nonstandard zones we just mentioned? Simple. Those nonstandard and pocketed zones have boundaries that do not extend to an arrow. Instead, they’re marked with a letter and a number. The letter, derived from international radio call letters, tells you which arrow of the Geochron to read, while the number shows the number of minutes the region deviates from standard time. For example, the designation of India is E + 30, which means you add 30 minutes to the time you read on the E pointer. You’ve just completed the most difficult calculation of international time a Geochron owner ever has to compute. Congratulations. WHAT DAY IS IT, ANYWAY: Reading the date and day of the week is a snap with Geochron. Since the map is moving from left to right, the International Dateline crosses the frame once each day. The days, date and month observed on either side of the Dateline are each displayed via indicators mounted at the Geochron’s bottom.